New Automated Troubleshooting Services From Microsoft Fix It. Microsoft’s Fix It Blog has launched a new Automated Troubleshooting Services for Windows. With one click, Microsoft can now detect problems on your machine and automatically fix any common problems that are found. Once you download the 519 KB, and run it, it will first download and install the Microsoft ATS engine. To detect and fix your problems, simply click on the Run Now button. Microsoft Automated Troubleshooting Services scans your computer and detects the root causes of common problems, then automatically fixes the problems that it finds, and Offers additional resources if the problem isn’t fixed. To begin with, a select number of common problems have been addressed, but more are on its way. 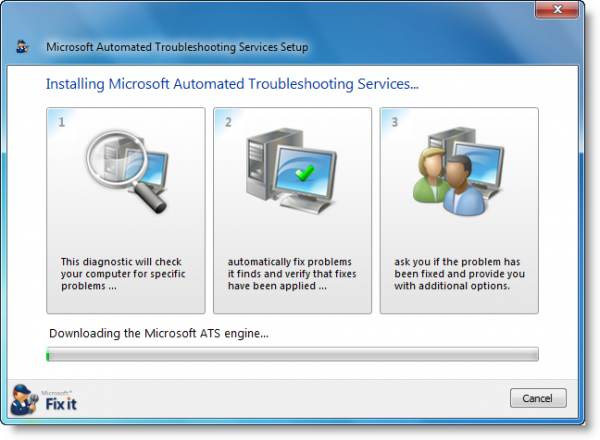 Do note that this Automated Troubleshooting Services is valid for Windows Vista & XP only. The reason Windows 7 has been excluded is probably because it already has native troubleshooting support. But hey, you can always use them in Windows 7 too! Thanks manekari, for the heads up. hey guys, this tool looks good but it’s hard to find the actual download link for the tool. Frustrated users are chemping at the bit!! Clicking on the desired link will open another page. There clcik the “Run now” button. can’t find the download link! ^ Click the Microsoft link given above and then from the left side panel select the product for which you want the fix it solution. You will see a lot of download links. For instance check below ‘Featured Diagnose and Repair Solutions for Windows’.